The International Civil Liberties Alliance (ICLA) has been spending a great deal of time within the current OSCE Human Dimension meeting (Warsaw 2013) trying to clarify the meaning of the term “Islamophobia”. Unfortunately, despite our diligent efforts no one has been able to provide us with an unambiguous and politically neutral definition. 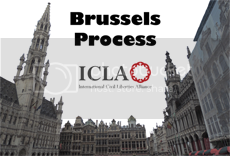 ICLA believes that the undefined nature of the term “Islamophobia” stereotypes and demonises any and all people who voice concerns about sharia law. As such we believe that the continued use of the term in this undefined form is actually a barrier to cooperation and dialogue and that it does little to solve the serious problem of discrimination against Muslims. The exclusion of ICLA and other stakeholders from the meetings that were convened to put together an OSCE booklet that had the subtitle “Addressing Islamophobia Through Education” was missed opportunity for serious dialogue on this important issue. If all stakeholders had been involved then people with divergent views would have come closer together and an honest and politically neutral definition of Islamophobia could have been devised. We believe that it is important to urgently address the matter of the definition of Islamophobia because the lack of a clear definition impacts negatively on many basic human rights that are claimed to be protected in international law. In addition to the obvious area of freedom of expression it also impacts negatively on things like freedom of assembly. 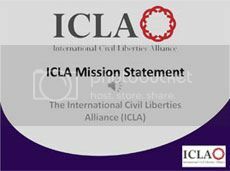 The International Civil Liberties Alliance is concerned about human rights abuses that can arise from certain aspects of sharia law. Increasingly any person or organization that has legitimate concerns in this area is unfairly labeled “Islamophobic”. This can impact negatively on freedom of assembly because a lack of definition contributes to the likelihood of them being physically or verbally abused, being unfairly demonized, being sacked from their jobs, and being subject to overzealous policing. (1) That the OSCE provide an official definition of the term “Islamophobia” including a comprehensive list of what Islamophobia is not. This would go a long way to helping organisations like ICLA to articulate their messages in the most sensitive way possible. (2) That the OSCE organize a much more diverse range of stakeholders to come together to create a revised booklet for educators that is both fair and politically neutral. For such an important publication to achieve what it purports to want to achieve, it has to be more inclusive with regard to those who compile it. Some would only chalk lines on their front doors to mark each day of Advent as it passed, while others would lit candles, either a single candle with 24 notches, or group of four candles, each representing a Sunday of Advent.At the end of the 19th century Advent calendars for kids had become a lavish affair. It has become difficult to uncover attractive designs these days, however, that aren’t merely chocolate-filled marketing tools.The other two cats were able to make the leap with the grace of gazelles. Eeny stared up wistfully at their bowl. It might as well have been at the top of Mount Everest as far as she was concerned. Some pieces of equipment are quite obvious. For instance, you need a racket and shuttlecock if you are a badminton player. However, there are items that you only become acquainted with as you go for more serious training.e U-Bahn station and opened in 1996.Casablanca storeIn 2008, the store announced a licensing agreement to open a store in Morocco Mall in 2010.So, where do you want to go? What is it you’d like to achieve in your personal and professional life?Setting goals allows for personal achievement, building your confidence and the learning that occurs along the way.Comparison of LANs and WANsLANs (Local Area Networks) and WANs (Wide Area Networks) are two basic types of networks used in digital communications. Since LANs spread over short distances (typically a fraction of a kilometer), they offer very high speeds.